As I was watching the grand finale of Cassini and listening to the mission team talk about the accomplishments of the mission, I learned a little bit about propellors. Not your typical airplane propellor, but the name used to describe this fascinating feature in Saturn’s rings. Seeing Saturn’s rings from afar, or even relatively close with Cassini, we see the rings as perfect. How do we end up with strange features and imperfections like this one? Looking elsewhere in the rings, we can find clues. The first clue is the namesake of the mission itself. The Cassini spacecraft was named for Giovanni Cassini, who discovered the dark gap in the rings in 1675, that would come to be known as the Cassini division. The second clue is the tiny white dot in the image at bottom left. That is the moon prometheus, known as a ‘shepherd moon.’ The final clue is the knowledge that the rings aren’t solid bodies, but are made of millions of tiny bits of ice and dust that are all different sizes. 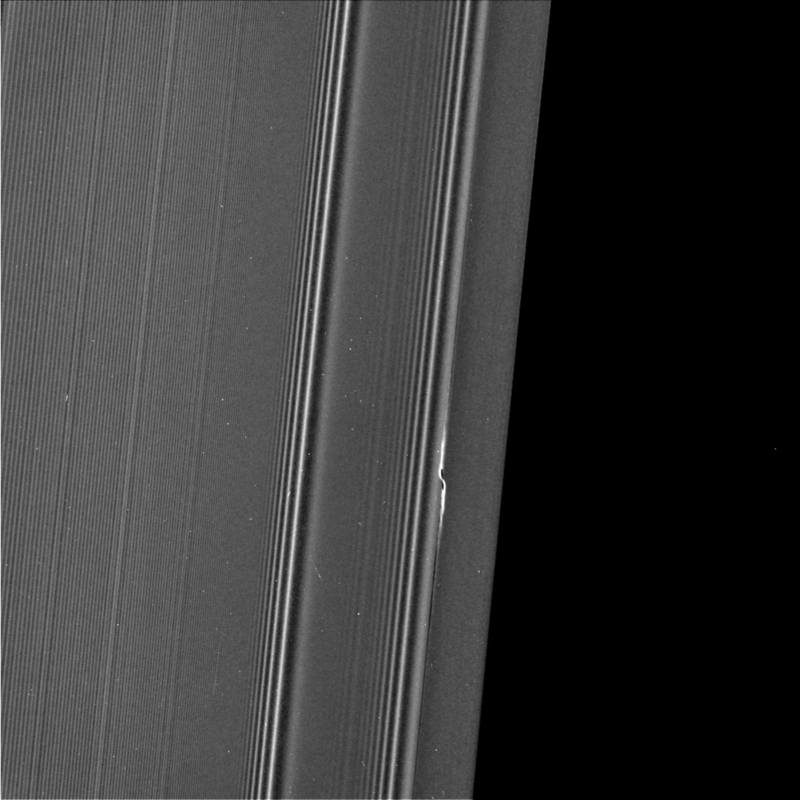 Knowing this, we can conclude shepherd moons like prometheus use their gravity to create gaps in the rings, smaller than the giant Cassini gap, but large enough to be seen in photos. But what about in-between sized bits of ring material? Pieces that are too big to be called a typical ring particle, but too small to be called a moon? These would have enough gravity to disrupt ring particles nearby, but not enough to sweep out an actual gap. This is exactly what’s happening with the Earhart propellor above, and all other propellor features. The moonlet is actually creating a small gap in the rings, but the gap is able to close before the moonlet moves very far. Only a shepherd moon like Pan or prometheus, thousands of times as massive as these propellor moonlets, can maintain a ring gap the entire way around Saturn. The result is a neat looking feature where the ring particles are deflected a few miles in either direction. The universe is always providing new surprises, and as they say the devil is in the details. 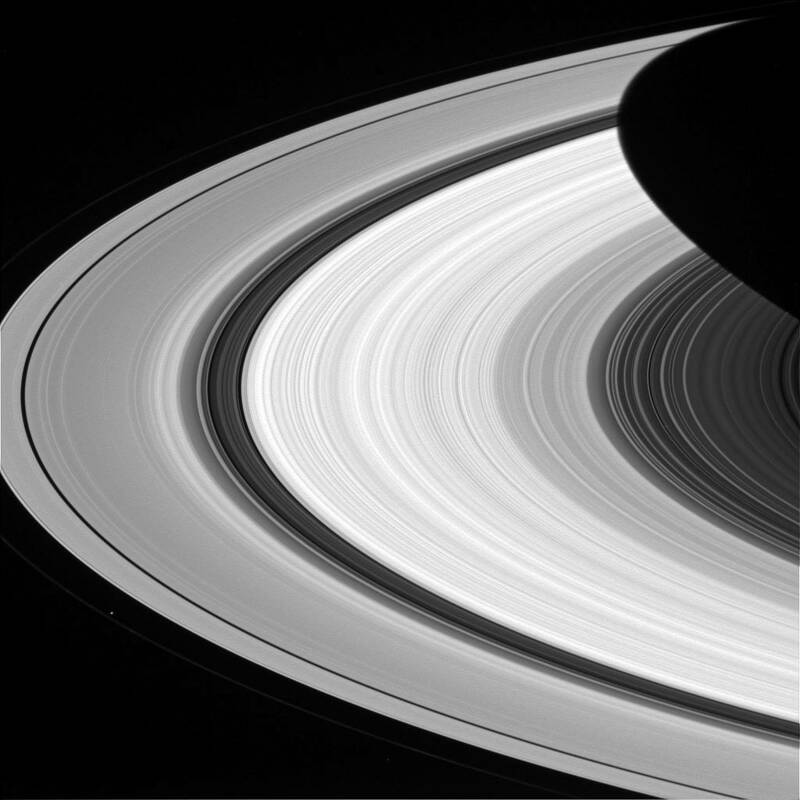 From the grandest scales we see perfectly smooth rings cleaned up by stable moons. But if we change our scale and go down to close in on the rings, we see a complex and chaotic system, full of turbulence and interesting features.